Hey Kyle Chandler, is a hot dog a sandwich? Is A Hot Dog A Sandwich?Welcome to **Is A Hot Dog A Sandwich? ** in which The Takeout asks famous and important people to answer the most important question to ever beguile the human race. 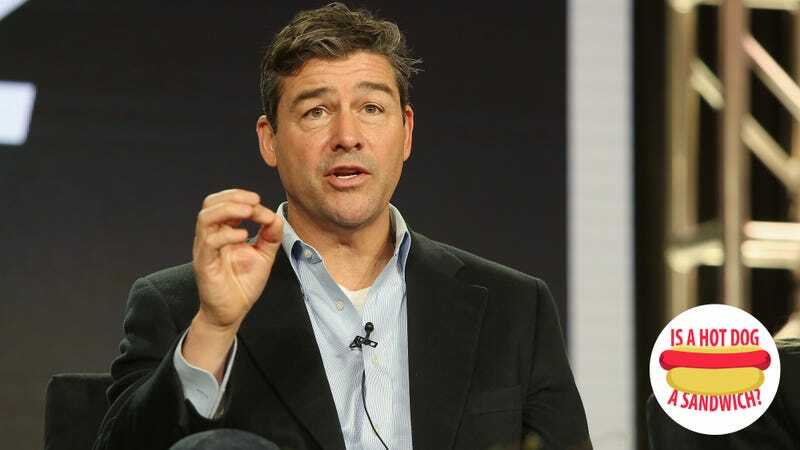 For many, Kyle Chandler will always be Coach. The critically acclaimed, fiercely beloved Friday Night Lights never found a wide audience during its run—after the first two seasons on NBC, the network struck a deal with DirectTV in order to continue the show, and the three subsequent seasons aired first on what’s now called the Audience Network before its run on NBC. Its low ratings didn’t stop the show from picking up some hardware, however, including three Emmy Awards (one of which went to Chandler). And it certainly hasn’t stopped the series from picking up new fans in the years since its conclusion. Say “clear eyes, full hearts” out loud, and someone nearby will say, “can’t lose.” That’s guaranteed. So consider this a recommendation and something of a warning: Kyle Chandler’s character in Catch-22 is not at all like Coach Taylor. Okay, he gives speeches, and sure, they’re supposed to be inspirational, but the eyes aren’t clear, the hearts aren’t full, and loss is pretty much guaranteed. As the paranoid, arrogant Colonel Cathcart, Chandler will serve as the villain of sorts in Hulu’s highly anticipated adaptation of Joseph Heller’s celebrated satirical war novel. It’s a safe bet that we’ll get a blistering performance from the actor when the miniseries arrives on May 17. What’s less certain is whether or not his answer to our question will pass muster. The Takeout: Is a hot dog a sandwich? KC: Because it’s served on a bun. TO: And a bun is not bread? KC: Yes. So it’s not a sandwich. Hey Zachary Levi, is a hot dog a sandwich? Hey Rachel Bloom, is a hot dog a sandwich? Hey Aidy Bryant and Lolly Adefope, is a hot dog a sandwich? Hey Colton “The Bachelor” Underwood, is a hot dog a sandwich? Hey Aubrey Plaza, is a hot dog a sandwich? Hey S. Epatha Merkerson, is a hot dog a sandwich?